FREE for a limited time – Adventure Basic School Math · Math Drills Challenge, Winter Adventure. 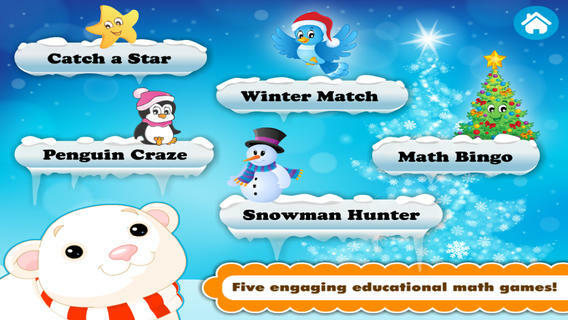 This educational app features cute penguins, chubby snowmen, Christmas characters, and more in 5 winter-themed games: Catch a Star, Winter Match, Penguin Craze, Snowman Hunter, and Math Bingo. Games can be set to practice 5 areas of math – numbers, addition, subtraction, multiplication, and division. For each area of math there are 3 levels of difficulty: easy(1-10), medium(1 – 20), or hard (1-100) – making this game suitable for a wide variety of grade levels. The app also keeps track of top scores for each game/area/level of difficulty. This app would be great in the classroom for many reasons – it supports multiple players, it’s customizable to the level of each child, it keeps track of high scores, it’s theme-based fun and provides great practice. It’s perfect for those crazy days right before winter break!